Ranked at #47 in my top-50 prospects to watch this year, Donte Paige-Moss is the line partner to the highly rated Quinton Coples at UNC. He never really blew me away in 2010 and certainly benefits playing on a talented defense, but he’ll get opportunities this year to boost his stock. Very much an outside linebacker or LEO prospect. Ranked #50 in my prospects to watch this year, Brandon Lindsey had ten sacks for Pittsburgh but could suffer due to the departure of Jabal Sheard. Tape courtesy of Aaron Aloysius. For the next seven days I’ll be in Portugal with limited internet access. I’ve set up some posts for the next week although it’s going to be mainly game tape. There’s a possibility Kip may put some more thought provoking articles on the blog too, so keep checking back. Don’t forget you can contact me via email rob@seahawksdraftblog.com if necessary, I will check those daily and it’ll be the best way to get an immediate reply. Any comments that are pending admin approval please be patient, I’ll get to them eventually. 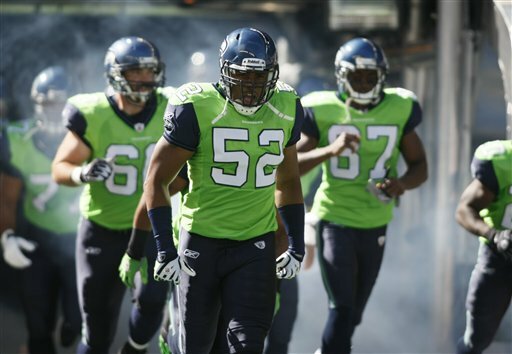 In the meantime, our friends at NFL Mocks have put together this report on Seattle’s 2011 draft class. We’re still many weeks away from any kind of positive conclusion to the current litigation situation in the NFL (and by positive, I mean any amount of football in 2011). Many people discuss the impact the lockout will have on the rookie class, but undoubtedly those hurt the most are the undrafted free agents. These guys need camp to fight for roster spots and prove their worth. Taking away precious practise time and possibly pre-season games could make them redundant and perhaps even a lost group. There are several big names who went undrafted and it remains to be seen whether they’ll ever get their opportunity. DeAndre McDaniel (S, Clemson) started the year being touted as a high draft pick after an eight-pick, two-sack 2009 season. He added four more interceptions in 2010 taking his total to 15 for his college career, yet he wasn’t picked in April. Several people were surprised fellow safety Joe Lefeged (S, Rutgers) went undrafted – some graded him in the middle round region. Will Hill (S, Florida) and Deunta Williams (S, North Carolina) were other big name safeties expected to fill out a disappointing overall class at the position. None found a home. I know the Seahawks have shown interest in several players, including Texas offensive lineman Michael Huey and Iowa linebacker Jeff Tarpinian. John Schneider has suggested the team will target an UDFA quarterback to compete for a roster spot or run the scout team, but there’s no obvious player for me that jumps out. Adam Weber (QB, Minnesota) and Adam Froman (QB, Louisville) have been touted, while Mike Coughlin (QB, Boise State) received some attention from several NFL teams before the draft. A lack of beef on the defensive line may make 6-1, 319lbs defensive tackle Ian Williams (DT, Notre Dame) a worthy candidate to compete for a roster spot. Cedric Thornton (DT, Southern Arkansas) is another player graded as a space eater with limited pass rush qualities. Ricardo Lockette (WR, Fort Valley State) has hinted at interest from Seattle while several relatively unknown receivers visited with the Seahawks before the draft. Terrance Toliver (WR, LSU), Dane Sanzenbacher (WR, Ohio State) and Armon Binns (WR, Cincinnati) should get the opportunity to impress, if not necessarily in Seattle. Major character issues dogged South Carolina tight end Wesyle Saunders – will he get a shot at redemption? The talent is there. But my top ranked UDFA, based on talent if not necessarily positional importance, is Iowa punter Ryan Donahue. He stuck out as college football’s top punter the last two years and should have the chance to come in and dislodge a veteran. Of course, those opportunities to make final cuts will be severely limited unless the lockout ends soon. Yesterday it was revealed that the NCAA infractions appeals committee would maintain all penalties and findings against USC. It means that Southern Cal will not play in a bowl game this season and will not have the opportunity to be crowned the first PAC-12 champions. Barkley already has two very successful years starting at Southern Cal, including a baptism of fire as a true-freshman starter. By the end of the 2011 season he’ll have had three year of starting experience, usually the point when most successful quarterbacks turn pro. The decision not to lift sanctions on USC will present a difficult situation for Barkley at the end of the year if things continue to go well on the field. Does he return for a fourth year as a senior, with the possibility of winning the PAC-12 and possibly a BCS bowl game? Or does he leave for the NFL as a high draft pick? As he admits in the interview, it’s something for the distant future and not an immediate concern. However, the inability to play in a bowl game this year could impact the decisions of several star players at USC, including offensive lineman Matt Kalil. Both Barkley and Kalil were listed among my top fifty prospects to watch in 2011. Thanks to Tim for the new designs. 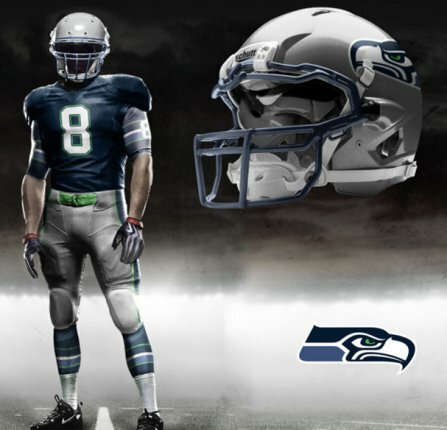 Don’t forget you can see his other Seahawks creations on his website or by reading yesterday’s article here. Introducing the new logo, introducing new uni’s? Today I’d like to introduce the new Seahawks Draft Blog logo. I’m sure you’ll all agree that my web designer David Leng at Starry Sky has done a fantastic job not only with the logo, but also with the new interchangeable banner. If you haven’t noticed already, keep your eyes fixed on the top of the page and wait ten seconds. You’ll notice the quirky new idea and this is something we can maybe play around with in the future, potentially having a top-10 mock draft included in the banner down the line. 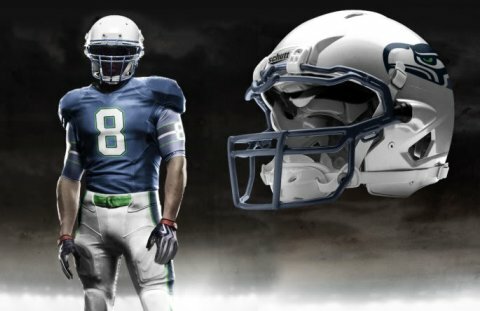 While we’re on the subject of design, you may also have noticed comments by Seahawks President Peter McLoughlin discussing the possibility of throwback uniforms in 2012 to coincide with the introduction of Nike as the new supplier, replacing Reebok. 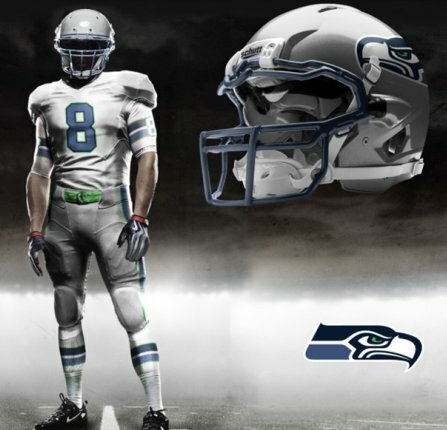 McLoughlin also touted the possibility of changes to the team’s permanent uniforms which have been in use since 2002. A bit like the draft, it’s a subject that some people love to discuss while others try their hardest to avoid. 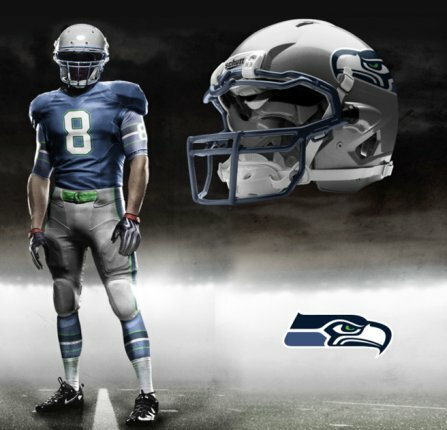 I’ll confess that I enjoy talk about uniform changes, but only because I’m only ‘satisfied’ with the current design. I’m sure others will disagree, but I think they look a bit dated and the constant mixing around of combinations (not to mention the hideous lime green number) is something that ultimately you’d prefer to avoid. I like the idea of a timeless look, one that can span generations. Green Bay, Dallas and Pittsburgh have managed to find rather simple designs that never age. I’d like to think Seattle can find something similar. The Vancouver Canucks ice-hockey team had a similar identity crisis, switching between many different designs before settling on a classic look during a league-wide overhaul of uniforms. For me, they have one of the best designs in the NHL. 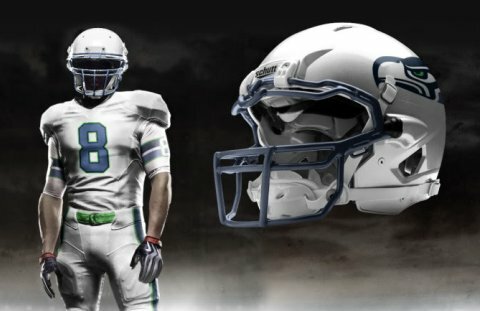 Perhaps it’s coincidence that their color scheme is one very similar to the Seahawks, but I don’t see any reason why Seattle can’t follow Vancouver’s lead. The design below has appeared on a number of web sites over the last couple of years and I don’t know the artist to give the appropriate credit, but for me this would be a great way to try and find that iconic look. McLoughlin mentioned in his interview that Pete Carroll had taken part in meetings the team had conducted with Nike about possible changes. Carroll had a significant role in a lot of the decisions USC made, possibly also in the team’s image. 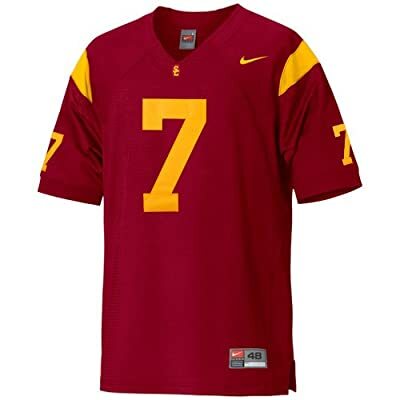 USC switched from this classic jersey used for many years and went for this look during the 80’s and 90’s. During Carroll’s era at Southern Cal, they went back to a more traditional design and also avoided the kind of gimmicks used by Nike for a lot of the other big schools. Could he add his voice to any claims for a similar change in Seattle? 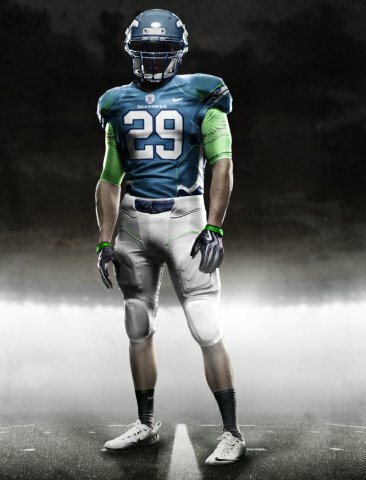 Of course one of the more recent gimmicks by Nike is the introduction of ‘Pro Combat’ uni’s for some select schools such as Florida, Alabama and West Virginia. 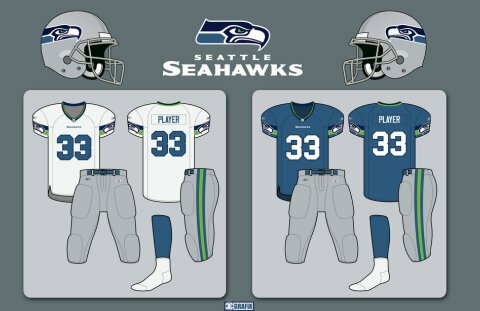 Tim O’Brien took the template for those uniforms and translated it over to the NFL teams. You can see his home and road ideas for Seattle below, as well as a further design from an anonymous artist. Whether you are for or against changes to the uniform it’s a topic that always generates a discussion. In the current climate of litigation, it’s one of the few topics left open. So what do you think? Brown denies Palmer talk, but what did you expect? Cincinnati Bengals owner Mike Brown today reiterated his previous stance to NFL.com’s Albert Breer that Carson Palmer will not be traded. This goes against what we have been discussing on this blog and has been talked about elsewhere too. Some have used the Mike Brown ‘never back down’ angle as proof that such a deal won’t happen. It’s a legitimate point, but also one based purely on assumption. The NFL lockout is still a long way from being resolved and there’s very little light at the end of that particular tunnel. Until a new CBA is signed or at least the new league season opened under 2010 rules, no trades or free agent movement can take place. What benefit would Brown get from discussing a Carson Palmer trade today? He has used the ‘no deal’ approach from day one, stating in January that a trade wouldn’t take place. While I appreciate that may eventually prove to be the case, it makes no sense to change tact and open up a can of worms while the league is still mired in litigation. Does he really want the media circus that would come with revealing a huge piece of news today, particularly considering non-litigation news is at a major premium in the NFL right now? We’ve previously reported that a 5th round pick and a conditional third would be the price range for such a trade. If Brown has any hope of perhaps improving that bounty, does adjusting his determined stance achieve anything but weakened leverage? The Bengals have well and truly moved on and their now former starting quarterback will move to the Pacific North West as a Seahawk or as a retired NFL veteran, so the talk of Palmer returning that we see today means very little. The drafting of Andy Dalton afforded the Bengals to commit to a new direction. While many think Brown will be stubborn enough to see this one through, as I mentioned last week this may not be a ‘battle lines drawn’ situation like some think even if it comes across that way in the media. Mike Brown has made this statement several times and it makes little sense to say anything else until the league is finally open for business. Some people will believe today’s comments to be the absolute truth, but don’t rule out the very distinct possibility that this was nothing more than a colorful ‘no comment’ or ‘nothing to see here’. I’m going to be away for most of Saturday but wanted to get this on the blog before I left. Here’s tape of Landry Jones’ performance against Nebraska in the Big 12 championship game from 2010. I discussed Jones in more detail during this interview with Field Gulls’ Dan Kelly earlier in the week.